A warmer Arctic and greener tundra might sound like good news for grazing animals. But the changes in the far north are actually making life much more challenging for wild reindeer. The animals rely on low-growing lichens, which are being swamped by taller plants. And more rain, rather than snow, when it falls onto freezing ground, forms a hard layer of ice that the animals simply can't push their noses through to feed. It's also said that a good summer day for a human in the Arctic, still and warm, is a horrible day for the reindeer because they're mobbed by the increasing number of insects. During warmer summers, the animals have to use so much energy to keep the flies away that they can't sustain themselves. The same report revealed that sea ice continues to shrink, and that changes are fuelling extreme weather patterns further south. 1. 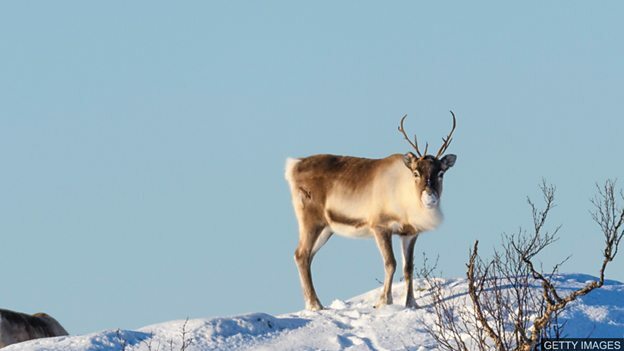 What do wild reindeer in the Arctic feed on? 2. Why is a good summer day for a human in the Arctic horrible for the reindeer? 3. True or false? A warmer Arctic and greener tundra are making life much more difficult for wild reindeer. 4. Which word in the text means ‘very severe in degree’? They feed on low-growing lichens. Because they're mobbed by the increasing number of insects due to the weather. During warmer summers, the animals have to use so much energy to keep the flies away that they can't sustain themselves. True. The changes in the far north are making life much more challenging for wild reindeer.